"Almeria, a remote and impossible land, lunar and dramatic, of a strange and suffocating beauty, is a delicious factory of illusions, an incomparable scenery." Ocholeguas, travel diary. Let's talk about Almeria, one of the most beloved cities in Spain and, without a doubt, one of the most well-known in the community of Andalucia. And, in case you didn’t know, it’s not that far away from us! That is why ESN Alicante has decided to organize a day trip to one of the most characteristic areas of Spain and our coast. In the morning we will visit its famous Alcazaba, where we will be able to enjoy a wonderful panoramic view of the city and the port. The Alcazaba can be seen from any point of the city, because it is the largest of the cities built by the Arabs in Spain. 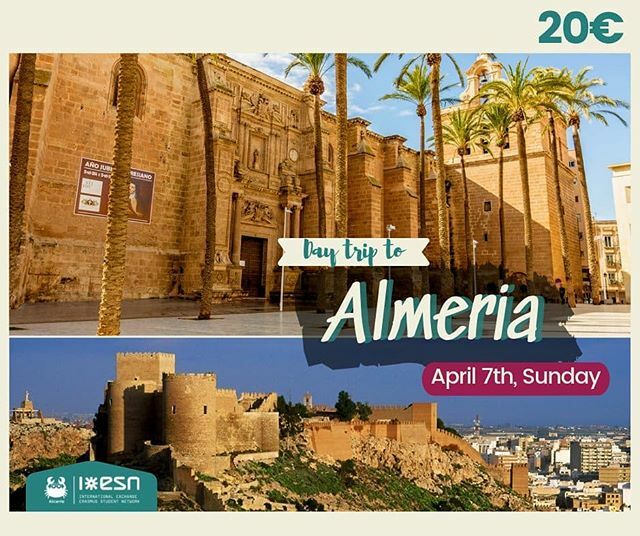 Once the visit to the Alcazaba of Almeria is finished, we will proceed to have lunch and later, our pals of ESN Almeria will take us on a city tour, helping us to discover the most beautiful, interesting and historical corners of the urban core. When you finally get to know the city a little better, we will have some free time before taking the bus back to Alicante. - WHEN? On Sunday 7th of April at 9:00 a.m. in Luceros. IMPORTANT We offer you a “Happy Monday”! What does this mean? That during Monday office hours you can buy the trip cheaper (15€) if you have ESNcard. - The rest of the days the trip will cost 20€ with ESNcard or 23€ without it.